The first reported Fontan procedure was performed on April 25, 1968, and involved direct anastomosis of the superior vena cava (SVC) to the right pulmonary artery (RPA) and right atrial appendage to the left PA (via the proximal RPA) in a 12-year-old child with tricuspid atresia. The procedure has been modified significantly since being utilized on patients with increasingly complex cardiac and vascular anatomy. Important aspects of patient and vascular pathophysiology have been identified as techniques and outcomes have improved. 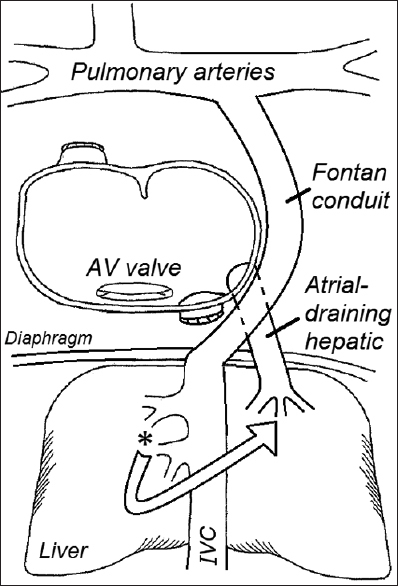 One known issue that can arise after Fontan completion relates to the presence of partially anomalous hepatic venous drainage. In this situation, one or more hepatic veins connect to both the inferior vena cava (IVC) (i.e., systemic venous circulation) and either atria (i.e., pulmonary venous circulation). This is a potential problem because the hepatic venous vasculature has the ability to remodel and form large interlobar connections in a short period. After Fontan completion, the hepatic veins in connection with the systemic venous circulation are subjected to significantly increased resistance while the hepatic veins connecting to the atria remain at lower resistance. This serves as an impetus for the development of these interlobar hepatic vein collaterals, creating a pathway with decompression of the systemic veins directly to the atrium with potentially massive right-to-left shunting. We present the case of a 4-year-old patient with heterotaxy, dextrocardia, mitral atresia, pulmonary atresia, d-malposed great vessels, supracardiac totally anomalous pulmonary venous return (TAPVR), and late-diagnosed partially anomalous hepatic venous connections. The child underwent TAPVR repair and central shunt placement in the 1st week of life followed by a superior cavopulmonary anastomosis (i.e., bidirectional Glenn) at 5 months of age. The patient did well in the interstage and post-Glenn periods. Pre-Fontan catheterization at 3 years of age demonstrated normal PVRi of 1.8 WUi with an unobstructed pulmonary venous confluence, no significant valvar dysfunction, and normal ventricular function. The Glenn circuit had no focal angiographic obstructions or pressure gradients, though Glenn pressures were 16 mmHg and the PAs were mildly hypoplastic diffusely. Multiple hepatic veins were visualized to connect to the IVC. Given the dextrocardia and borderline PA anatomy/pressure, an extra-cardiac Fontan (18 mm) was performed. The patient had a tenuous postoperative course secondary to conduit obstruction related to her dextrocardia and resultant tension on the SVC anastomosis. The child required extracorporeal membrane oxygenation with stent placement in the conduit on postoperative day 3. The patient had a steady though protracted recovery, but developed slowly progressive and profound hypoxemia and polycythemia (SpO265% and hemoglobin 22.4 g/dL) beginning approximately 1 month after Fontan. 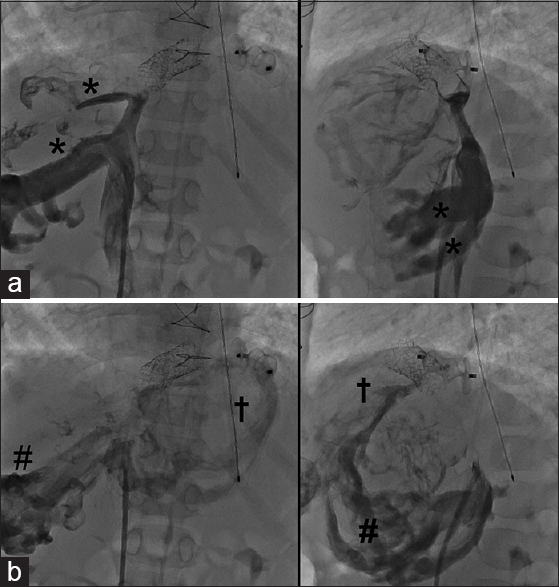 Subsequent catheterization diagnosed massive right-to-left shunting via hepato-hepatic venous collaterals–allowing systemic venous blood to bypass the PAs and flow directly into the atrium–with little-to-no effective antegrade pulmonary blood flow [Figure 1] and [Figure 2]. At this time, we retrospectively reviewed a prior computed tomography scan that was interpreted as having normal hepatic venous drainage. The scan demonstrated at least one hepatic vein, very small at the time, that anomalously connected directly to the atria. We first attempted percutaneous occlusion of the anomalous hepatic using a vascular plug, a technique previously described. The procedure was acutely successful with an increase in SpO2 to ~85%. A second, smaller, and unrecognized anomalous hepatic vein was present, which slowly enlarged resulting in fairly rapid regression to the same degree of preocclusion cyanosis [Figure 2]. After multidisciplinary discussion, we opted to attempt a novel percutaneous therapeutic strategy involving modified covered stent placement. At the next catheterization, we modified an 8-zig, 22-mm long covered Cheatham-Platinum® (CP) stent (B. Braun, Bethlehem, PA, USA) by cutting a small hole (1–2 mm) in the expanded polytetrafluoroethylene lining one-third from the stent end. During catheterization, an 0.018” wire was advanced into the largest hepatic vein connected to the IVC. The back end of this wire was placed through the hole we cut in the CP stent, and the stent was then mounted on an 18 mm Balloon-in-Balloon® catheter (PFM Medical, Carlsbad, CA, USA). 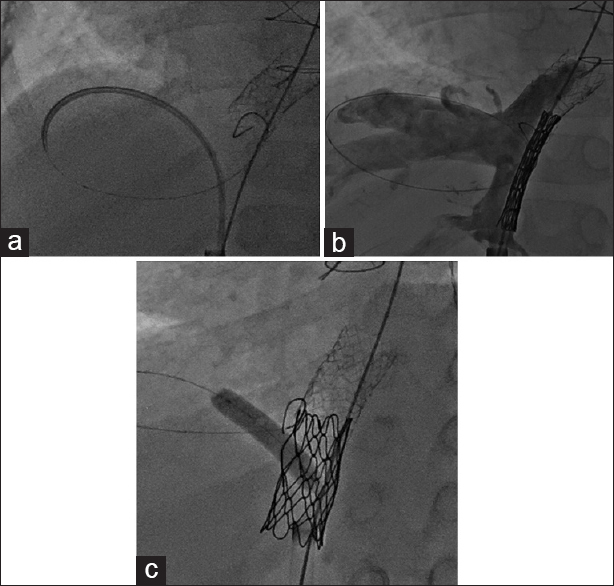 The balloon-stent assembly was loaded onto a delivery wire in the SVC, and then stent was deployed. Sterling balloons® (Boston Scientific, Marlborough, MA, USA)–4 and 6 mm–were next used to dilate the side hole, creating a functional “fenestration” [Figure 3] and [Figure 4]. The procedure was well tolerated, with SpO2 rising to 85% in room air immediately, and symptoms improving over coming months. Follow-up echocardiography demonstrated a 4 mmHg fenestration gradient and normal hepatic venous Doppler signals [Figure 4]. Hepatic elastography will be followed serially. Techniques have been described to deal with anomalous hepatic venous drainage resulting in cyanosis and shunting. In addition to the report above by Guerin, open surgical ligation techniques have been described using ultrasound guidance; interestingly, a similar report described a case in which a second additional anomalous hepatic was not identified like our patient. The fundamental treatment must involve occlusion of all anomalous hepatics that drain into the heart or all hepatic veins arising from the systemic circulation as in our case. In an attempt to curb protein-losing enteropathy (PLE), Brizard et al. have recently employed a similar rationale as LeCompte relating to post-Fontan effusions. That team has performed an operation re-directing the three major hepatic veins from the systemic venous circulation directly to the atria while placing a covered stent in the intra-hepatic IVC to exclude smaller hepatic veins. Their rationale is that the higher hepatic vein pressures associated with a traditional Fontan are transmitted to the portal venous system, which overcomes regulatory mechanisms resulting in PLE. They have reported two patients in whom this technique was employed, and both had resolution of PLE with follow-up of 7 and 19 months. Kogon et al. have employed another unique operative technique in single-ventricle patients. That team performed Fontan completion by dividing the IVC below the liver and connecting the infrahepatic IVC to the pulmonary circulation using an extended extracardiac conduit. 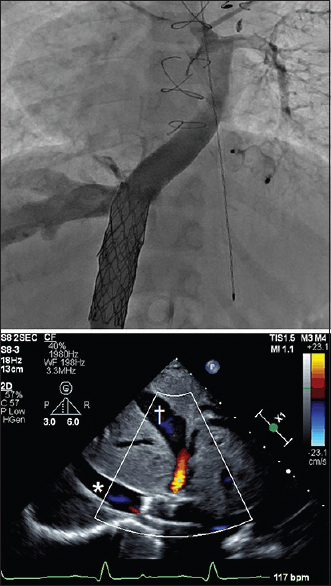 The native IVC to atrial connection was left intact, so that all hepatic veins drained directly into the atrium. In essence, the team recapitulates the “Kawashima” circulation, a subset of patients with low incidence of PLE. More data are required to determine the safety and efficacy of these techniques, but the initial results are promising. One specific concern in our patient is that the lobes of liver that were draining through normally connected hepatic veins now decompress through the interlobar hepatic collaterals [Figure 1]. These connections have presumably higher resistance, so those segments of liver remain under somewhat higher–albeit an unknown degree–pressure compared to the atrium. However, we know the resistance through this collateral network is lower than the Fontan circulation given the rapid and progressing cyanosis the child developed prior to this intervention. Nevertheless, we plan to monitor hepatic function and elastography at regular intervals to investigate this effect on the liver. In addition, the lack of “hepatic factor” flow to the lungs is a concern for the development of microvascular pulmonary arteriovenous malformations. We will monitor for this condition as an additional operation to incorporate hepatic venous blood into the Fontan circuit may be indicated. Patients with heterotaxy and single-ventricle physiology can develop unique circulatory pathology that evolves after operations for single-ventricle palliation. Covered CP stents can be modified to serve unique needs including creation of fenestrations for decompression of the Fontan circulation and maintaining access to “jailed” vessels. Fontan F, Baudet E. Surgical repair of tricuspid atresia. Thorax 1971;26:240-8. Ohye RG, Schranz D, D'Udekem Y. Current therapy for hypoplastic left heart syndrome and related single ventricle lesions. Circulation 2016;134:1265-79. Guérin P, Losay J, Baron O. Transcatheter occlusion of an intrahepatic venovenous fistula after modified Fontan circulation by implantation of an amplatzer atrial septal occluder. Catheter Cardiovasc Interv 2005;64:117-20. Lecompte Y. Subtotal cavopulmonary connection. J Thorac Cardiovasc Surg 1992;104:1500. Jacobs ML, Norwood WI Jr. Fontan operation: Influence of modifications on morbidity and mortality. Ann Thorac Surg 1994;58:945-51. Schneider DJ, Banerjee A, Mendelsohn AM, Norwood WI Jr. Hepatic venous malformation after modified Fontan procedure with partial hepatic vein exclusion. Ann Thorac Surg 1997;63:1177-9. Reed MK, Leonard SR, Zellers TM, Nikaidoh H. Major intrahepatic venovenous fistulas after a modified Fontan operation. Ann Thorac Surg 1996;61:713-5. Erickson LC, Lopez A, Vlahakes GJ, King ME, Doody DP, Lang P, et al. Massive intrahepatic shunting seen as severe cyanosis after the Fontan procedure in heterotaxy syndrome. Am Heart J 1996;131:608-11. Rao IM, Swanson JS, Hovaguimian H, McIrvin DM, King DH, Furnary AP, et al. Intrahepatic steal after Fontan operation with partial hepatic exclusion. J Thorac Cardiovasc Surg 1995;109:180-1. Fernandez-Martorell P, Sklansky MS, Lucas VW, Kashani IA, Cocalis MW, Jamieson SW, et al. Accessory hepatic vein to pulmonary venous atrium as a cause of cyanosis after the Fontan operation. Am J Cardiol 1996;77:1386-7. Yoshimura N, Yamaguchi M, Oshima Y, Tei T, Ogawa K. Intrahepatic venovenous shunting to an accessory hepatic vein after Fontan type operation. Ann Thorac Surg 1999;67:1494-6. Ikeda A, Hiramatsu Y, Horigome H, Hori T, Noma M, Sakakibara Y, et al. A pitfall in ligation of intrahepatic shunting after Fontan type operation. Asian Cardiovasc Thorac Ann 2006;14:e6-8. Brizard CP, Lane GK, Alex G, Cheung MM. Original surgical procedure for the treatment of protein-losing enteropathy in Fontan patients: Report of two midterm successes. Circulation 2016;134:625-7. Kogon B, McConnell M, Book W. Fontan conversion with hepatic vein exclusion: A means for hepatic preservation in single ventricle heart disease. Cardiol Young 2016;26:582-5.